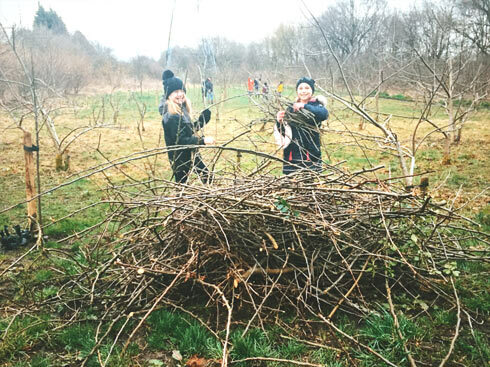 On Sunday, a group of regular orchard volunteers & others keen to learn about pruning braved the cold weather to give the fruit trees at the Sidings Orchard in Mersey Vale Nature Park a long needed prune. Pruning is an essential part of keeping fruit trees healthy and productive and when we looked at the trees in the summer last year (image left) we knew that a good pruning session was needed before they blossomed again. 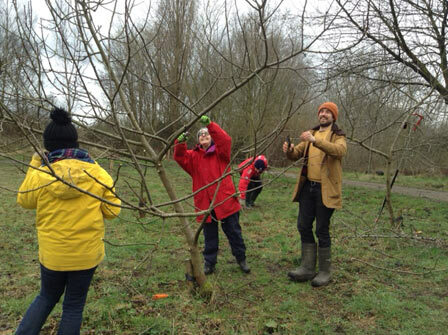 With expert tuition and guidance from Dan – from The Orchard Project & Helping Britain Blossom – the group set to with secateurs and pruning saws. It was a fun and educational day. The trees looked a bit sad at the end of the session but Dan reassured the group that their efforts would help make them happier and healthier. 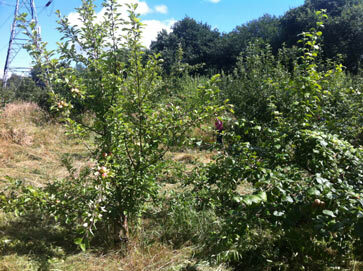 They’ll be more work days here throughout the year to help keep the orchard in good condition. We are told it is one of the largest in the borough! 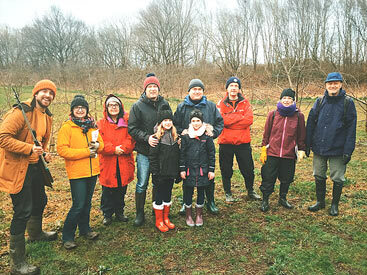 And, after the wonderful Wassail here earlier this year (again supported by Helping Britain Blossom – see links below), we look forward to more community get togethers to enjoy all that this wonderful community orchard has to offer. CLICK HERE to see some of the pictures from the Wassail in January 2017. CLICK HERE for a video of the King & Queen crowning. If you like the sound of what we are doing here and want to get involved then have a look at our events page and come along to anything that interests you. Or get in touch with us. There are varied jobs to suit all interests and abilities (no experience is needed) and even if you only have a little time to spare, your help will be very much appreciated.